The StingRay fresh hot water rinse system is unique, providing a heated fresh water rinse at the end of each wash cycle to remove remaining detergent. No rinse water is discharged outside of the parts washer. All rinse water becomes make-up water for the wash system increasing the life of the detergent bath. The system is Closed-Loop Zero-Discharge meeting the goals of Green Technology. Fan nozzles are ideally positioned within the parts washer cabinet to completely rinse the entire parts load. The precision engineered rinse generates large size water droplets for maximum cling and minimum bounce for rinsing parts. Laboratory tests prove StingRay’s rinse has higher rinse efficiency than parts washers using high pressure rinse systems. StingRay's large droplet rinse floods down the parts allowing the rinse water more time to absorb and flush the detergent back into the bath. The exclusive stainless steel heat exchanger utilizes turbulent flow heat transfer to heat the rinse water. Heat transfer occurs from the immersion in the wash reservoir solution making it intrinsically safe as it can never overheat. All rinse system components are totally corrosion resistant to prevent rust from untreated fresh water. 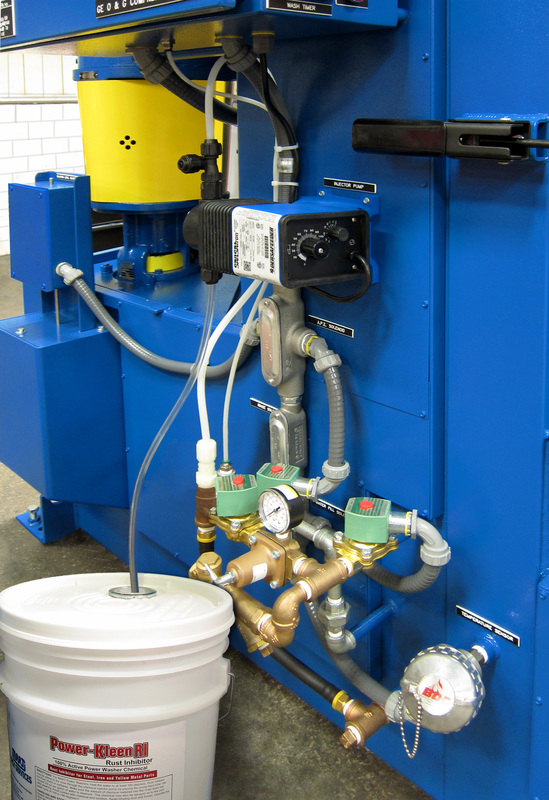 Rinse duration and rinse pressure are adjustable for parts washer process control. StingRay pioneered the corrosion resistant rinse systems due to the corrosion and plugging of nozzles with steel and black iron systems. Make the StingRay Rinse system an integral part of your parts washer for long trouble free life and to prevent nozzle clogging caused by corrosion. The proprietary Rinse Bank provides extended rinse times over systems that fill to a set-point. The Rinse Bank accumulates reservoir volume during non-washing periods allowing for longer rinses. The StingRay solution level management system monitors tank fluid levels and prevents solution overflow. As an integral part of the rinse system, the powered steam exhaust eliminates water vapor from the cabinet during wash cycles thereby allowing rinses without overflowing the wash tank. Additionally, the automatic steam exhaust prevents steam discharge into the plant during the cleaning cycle creating a safer working environment around the machine. The optional rinse injector pump can mix rust inhibitor with fresh water to provide short term rust prevention and prevent flash rust on freshly cleaned parts. With the injector pump, Power Kleen RI Rust Inhibitor chemical automatically mixes with the rinse water to prevent flash rusting of freshly washed iron and steel parts. The left hand photo is without the rust inhibitor and the right hand photo demonstrates the results with a rust inhibitor injector pump.